Hemis Festival is celebrated in the cold barren desert of Ladakh every year on the 10th day of the Tse-Chu as per the Tibetan calendar. It’s a 2-day celebration marking the birth anniversary of Guru Padmasambhava. The festival is hosted by the Hemis Monastery, which is the biggest Buddhist Monastery of Ladakh. This year the celebration will take place on 23rd and 24th June. The highlighting elements of the festival include Chham Dance, a depiction of the triumph of good over evil. These dances are accompanied by sacred plays entertaining the spectators. The lamas wear vibrant costumes and dance to the tunes of drums, cymbals, and longhorns. Following the traditions, the monks wear long gowns, masks, and a headgear. These masks carry a special significance with them. By the end of the celebrations, the head of the Black Hat dancers destroys a sculpture made of dough symbolizing evil powers. This indicates warding off the evil spirits. When the sculpture is destroyed, the broken pieces are thrown in four different directions. The entire celebration is presided by the Head Lama or ‘Rinpoche’. During the festival, there are several stalls inside as well as outside the monastery. These stalls carry unique handicrafts of the region and delightful delicacies of the mountain Kingdom. Besides, local liquor known as ‘Chang’, is also served to the people. There will be a special ceremony in which the largest thangka of Guru Padmasambhava decorated with gems and pearls will be uflured. 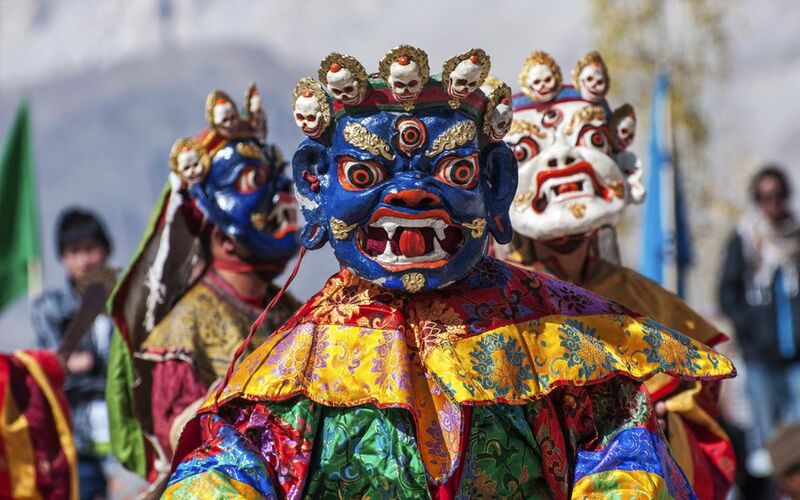 Hemis festival is an occasion depicting the spiritual faith of the people alongside the art and craft of the natives. It’s ideally suitable for adventurous people, photography lovers and everyone who wishes to explore the culture of Ladakh. The scenic beauty of the place combined with the rich culture and spirit of the mountain kingdom together serve as a tempting and unforgettable experience.